[pinit] After my 8 gluten free brownie recipe extravaganza, where I feared that I had possibly overdone things in the brownie department, our friend and fellow blog reader Donia /rhymes with Lasagna/ wrote me to tell me how wrong, very very wrong, I was. I had underdone gluten free brownie recipes! She told me about a crunchy brownie, but I’m not allowed to say the name of it because I got a letter from a lawyer. It’s a crispy top-of-the-brownie treat that is apparently taking the snack world (and Costco) by storm! I had never even heard of it (I don’t get out much), and they definitely don’t have a gluten free variety. So … I did the only reasonable thing. I made my own. I scoured the company’s website, read all the amazon reviews I could find on this stuff, then turned to the ingredient list itself (that is always my copycat recipe starting point). 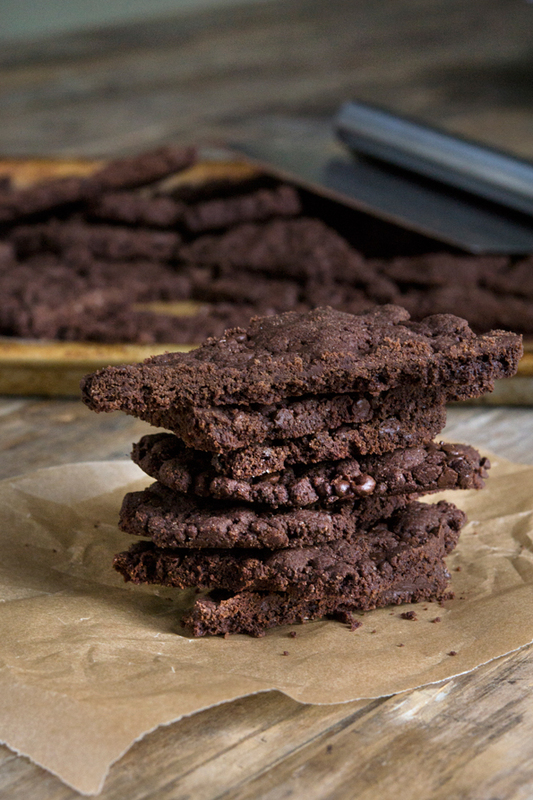 These gluten free crunchy brownies have all the richness and chocolatey-ness of brownies, but in a crispy snackie little thing. You’re gonna love it. It’s really quite crumbly (kind of like the crispiest gluten free chocolate chip cookies, which I also used as a guide for creating the recipe), but in the very best way. The unbaked batter doesn’t look too different from the final brownies. Once it was baked, I broke it up into triangles with the edge of a bench scraper, but mostly because I wanted to be sure I got some pretty pieces since I take pictures of my food. If you’re normal, and don’t photograph your food, you can just break it up all irregular-like. 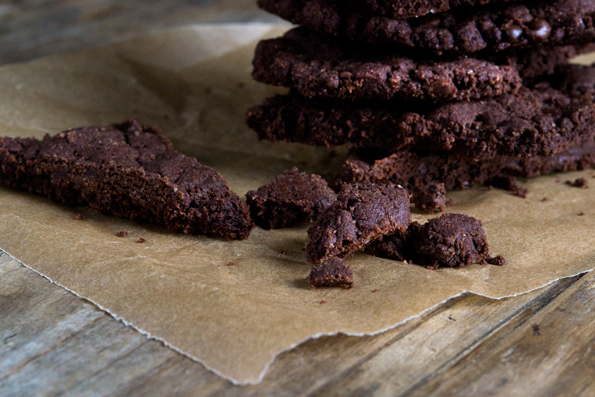 So … do you know of these crunchy brownies? Or are you like me and had to wait for Donia to tell you about it? Preheat your oven to 325°F. Line a large rimmed 13-inch x 18-inch (half-sheet) pan with unbleached parchment paper, and set it aside. In a small, heat-proof bowl, place the butter and chopped chocolate, and place over a simmering pot of water, making sure the water doesn’t touch the bottom of the bowl. Melt the butter and chocolate, stirring occasionally, until smooth. Remove from the heat and set aside to cool briefly. In a large bowl, place the flour blend, cocoa powder, baking soda, salt and sugar, and whisk to combine well. Create a well in the center of the dry ingredients, add the chocolate and butter mixture and mix to combine. Add the egg white, and mix to combine again. The mixture will be thick and somewhat crumbly. Add the miniature chocolate chips, and mix until they are evenly distributed throughout the batter. Transfer the mixture to the prepared baking sheet, and spread into an even layer. Place another sheet of parchment paper on top of the batter in the baking sheet, and top with another half sheet pan. Press down evenly on the top sheet pan to press the batter into an even, compressed layer. Remove the top baking sheet and parchment paper, and place in the center of the preheated oven. Bake for about 15 minutes, or until the brownies are mostly firm to the touch. Turn off the oven, prop open the oven door about 4 inches, and allow the brownies to sit in the oven for 15-20 minutes, or until the oven temperature has dropped to about 150°F on an oven thermometer or the brownies are crisp. 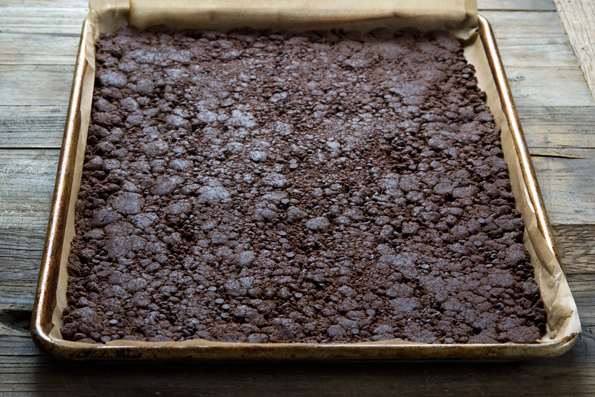 Remove the baking sheet from the oven and allow to cool for a few minutes before breaking the brownies into irregular pieces. Store at room temperature in an airtight glass container to retain crispness. P.S. Have you pre-ordered Bakes Bread ? The first giveaway will be announced next Monday. Order now and join us! Has anybody made this with a sugar substitute? Like Stevia in the Raw! Interesting. I had no idea about gfreely. I wonder if they are, in fact, somehow connected. Can’t wait to try this recipe! You rock, Nicole! Completely unrelated to today’s recipe, I wanted you to know the pound cake from yesterday is so very good. It even got two thumbs up from mom, which is saying something these days. I hope it freezes well since I froze half of a loaf for later. Dana, I’m a gooey brownie lover, too. But sometimes you see these products in the store and just need to try them! I’m thinking they would be great in a trifle, where it’s good to have a baked good to absorb a bit of the moisture. I am so excited to try making brownie brittle, gluten-free! I tried another GF Girl’s blogger’s and her brownies were awful, and now that she won’t offer substitutions I won’t be back. You have a reader for life, my dear. I made that gluten-free brownie recipe from Gluten Free Girl’s site. She advised putting the glass pan out of the oven right into ice water, which could have shattered the entire pan. Not smart. She has no cooking credentials ata ll. Thank you, Donia, for prompting this!! Thank you, Nicole, for doing the hard work for us! Because you toil so, it forces me to make this — we cannot have you toiling for nothing, can we? Indeed, if people don’t make it, Nicole has toiled in vain. And I don’t think ANY of us wants that on his/her conscience! hmmm, I don’t have a half sheet baking pan. Is it worth it to buy one :) or is there another size pan I could use. Thanks, these look very yummy! Oh, you really can use any size rimmed baking sheet, Susan. The important thing is that it’s a thin layer of dough/batter, or it won’t crisp. So, if you have quarter sheet pans, just divide it among 2. Hope that helps! I was so glad to see this! I just saw this at Sam’s and was drooling. I’m trying this tomorrow on my day off! I definitely know about this stuff. I’ve seen it at bed, bath, and beyond. Of course it was not gluten free but I did get some GF stuff in my glutenfreely box one month. I’m sure yours will be much much better! Yum! Another question about the pumpkin butter – when referencing the ounces in a recipe is that volume or weight? Thanks! Really, Jennifer? General Mills makes a version of this? I had no idea. “Ounces” is always a weight measurement. 1 oz. = 28 grams. 1 pound = 16 ounces. “Fluid ounces” is a liquid measurement. 8 fl. oz. = 1 liquid cup. Hope that helps! yes – that helps a ton. Thanks so much. I’m going to get my pumpkin butter recipes going tonight!!! so excited. oh my – I may have gotten the name wrong of my box shipment – it is gfreely.com and I don’t think affiliated with General Mills(Headquarters in MN!!! ), though very close in name. they get products from all over and send it out monthly. It’s fun. Gluten freely is, indeed, a General Mills venture. They began as a separate entity, affiliated but not owned by General Mills, and then were acquired by General Mills. They had a much more robust site (I used to be a part of its “Community”), and instead folded most of their content into the Betty Crocker site, I think. There are a number of my gluten free recipes on the Betty Crocker site, but totally uncredited! I didn’t know that they were keeping up the selling of gluten free products. Sounds like fun! Well then – I, for one, will not even consider this glutenfreely thing or using Betty Crocker because of the posting of your recipes without crediting. Did they even ask you? Oh, no, Mare! I’m afraid I wasn’t clear. The work is uncredited on Betty Crocker, but the terms of my agreement with General Mills were that the content I provided them was theirs to do as they wished! They’re not doing anything technically wrong. But thank you for your loyalty!! The General Mills “GlutenFreely” no longer exits. It’s folded into the General Mills “Live Better America” site. GFREELY.com is a totally separate entity that sells GF foods & gift boxes. Very similar names, but I don’t think they are related at all.